I have some very good handlers. Augustus, 18, is a neighbour high school boy who ventured in from whereever: a background in wilderness and hikes, Lars Monsen fan, and eager to learn. His third season on the runners. Marte, a graduate from a Folkehøyskole with mushing as theme, and a year as mushing instructor, a dedicated photo and journalist student and lso in her 3rd year in the kennel, and Sanna, 19, fresh from sports high school with er own alaskahusy, new in dog sledding and a (not so dedicated maybe) student of history. The two girls are wonders to have in the house: they mush, cook, clean, feed dogs, care for dogs and are fun to be with – in my house there are sounds of life, yatzy, scrabble end facebook and delicious meals. Outside there is sledding and skiing and campfires in the woods. So the year 2012 is the year of rookies. Though, Johanne herself did the first two races, to get us started and to get a feel of the dogs and train some dicipline. This year has been a year with time constraints in training, due to work comittments, travel and lack of snow. 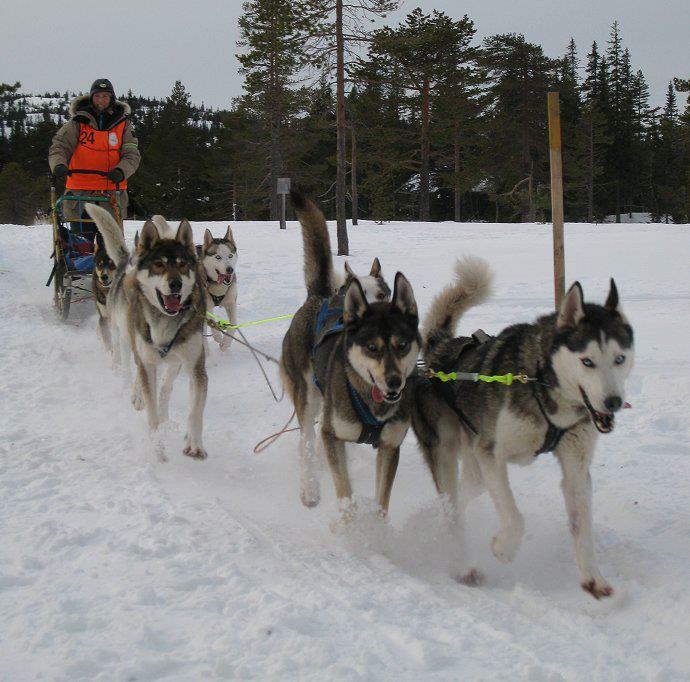 We have done Hamar hundekjører festival, 2 x 45 km, and that one we won, even over the 3 alaskahuskies. GOOD! The Vikerfjell, a bit longer (2 x 65) and more “plump” – but not so bad there either, in the midddle of the list of 16 entrants (no 8). Around 15 head on passings that went just fine! We are gradually increasing distance….we don’t ned a lot of tired dogs early this season. Then Augustus got a chance to try them on Hallingen 2 x 80. His first long race, and got a strict message to just lead them trhough, slowly, no pressing or asking for speed. And controlled passings…..He did fine, though, the dogs came in last. This was ok, as it means Augustus has done a good job with dicipline and endurance. The are still fit, a little stiff and tired when coming in, but quick recovery. Tipp has a slight rear injusy (he cannot tolerate “plump” due to his earlier injury in the loin) – and poor Kobuq lead dog seems mentally tried of al the leading. Nowadays he enjoys being in the sofa. Next is Marte and Femunden 400. Before that. skiing and motivation. Thereafter Sanne t the Husky race. And finally grandmother in Finnmark 500. Inshalla!